In the centre of the expansive country of India, is a city coming into its own. Over the last 15 years, Hyderabad has turned from a cluster of traditional villages centred around the historic Golconda Fort and Charminar Mosque, to India’s buzzing new Silicon Valley with the likes of Facebook, Apple and Google’s Indian HQs in its midst. These shades of old and new India blend beautifully into each other, and it’s no surprise to see Hyderabad excel in modernity in parts. It’s also fitting that ITC’s latest hotel, the Kohenur, makes the most of new technologies and old traditions. You’ll be greeted with a traditional scarf and ceremonial bindi when you step in, but enter your room and all controls are through an iPad. A point re orienteering: Hyderabad is huge. Huge. What looks like walking distance on Google Maps turns out to be a bit of a drive (and with erratic sidewalks and driving, walking isn’t really an option anyway). That in mind, the ITC Kohenur is in Madhapur on the fringes of Hi-Tec City, the area of new Hyderabad in which the tech companies reside. 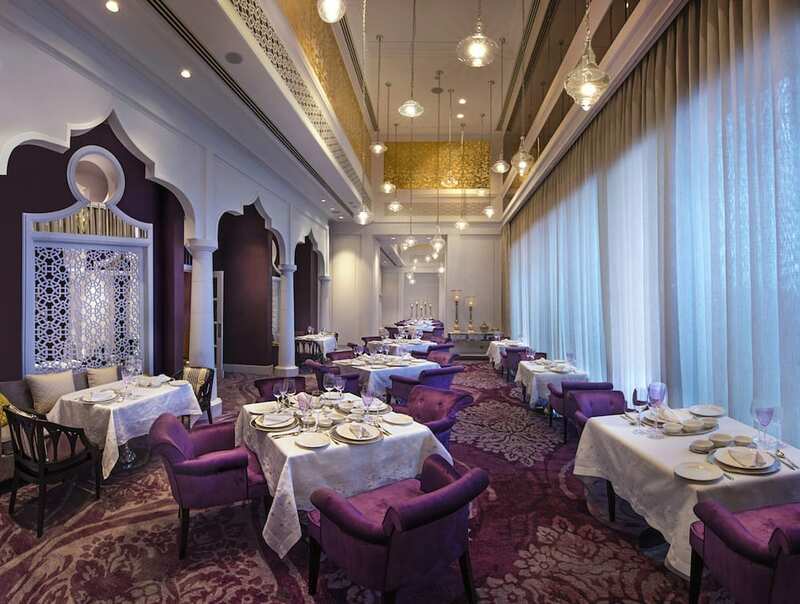 But a business hotel it is not; the sights of Chaarminar, Golconda Fort and Chowmahalla Palace ensure an increasing stream of leisure travellers in the area. 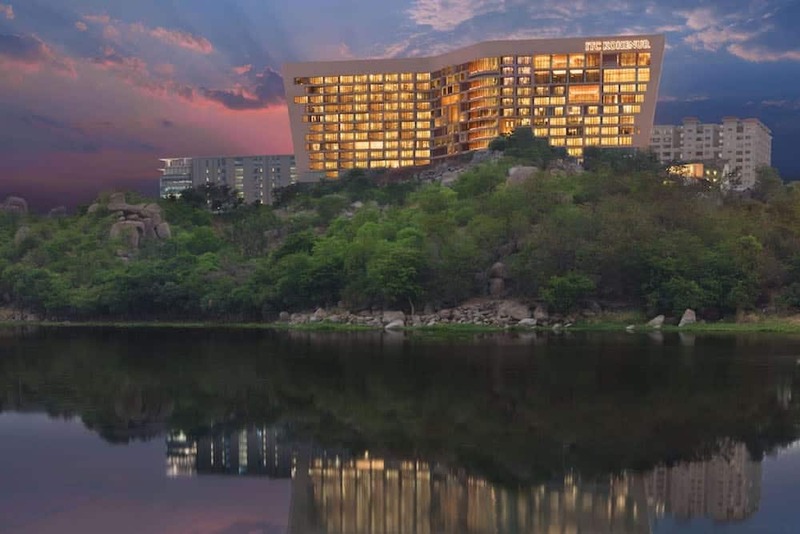 It offers views of the Durgam Lake, though balcony views might offer the odd vista of a worksite too, as Hyderabad is a city in development. There’s internal flights from the major cities, and also direct flights from London. My trip took me through Delhi via the Indian carrier of Jet Airways, an airline that auction their business and first class seats – worth noting to make the most of their ‘dine anytime’ menu of Indian cuisine with the odd English dish like a lamb burger, champers on tap, and flat-bed seats. Heavenly. 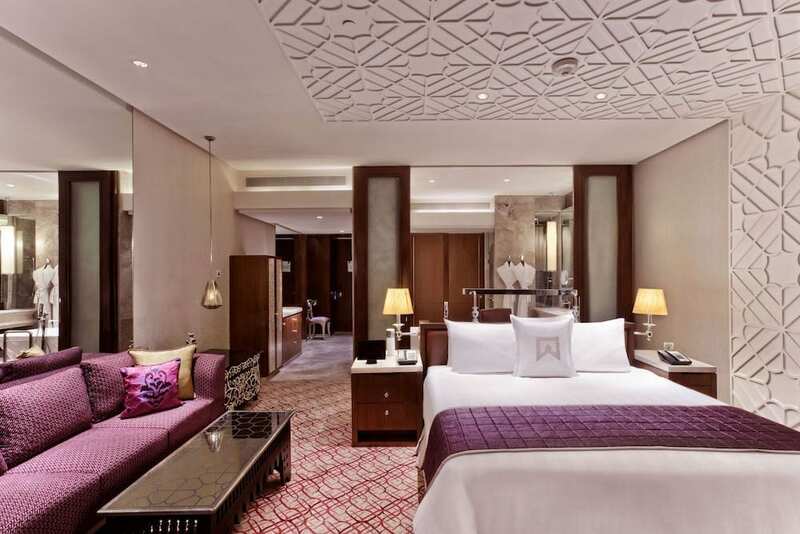 The most striking features of each room – from the entry-level standard up to the bullet-proof Presidential Suite – are the size and the Eastern-tinged décor. Monsoon-lovers will be right at home with heavy silk curtains, hexagonal mirrored tables and patterned accoutrements like vases and cushion covers. As a ‘hi-tec’ hotel that opened in summer 2018, it’s kitted out for our tech needs: English plugs have a home in the walls, and there are USB ports right by the bed. Most impressively, there’s an iPad in every room that controls everything from the lights to room service. Snazzy stuff. How did I sleep? I was out like a light, as it happens. I didn’t even need the help of their thick blackout curtains, nor their Sleep Box, featuring pillow mist, a de-stressing spray, ear plugs and eye mask. These are a product of their sleep lab in Bengaluru (formerly Bangalore) where a team of scientists figure out how ITC guests can get better sleep. So while the rooms look impressive, there’s thought where it matters too. Like the rest of the country, which isn’t short on human resource, service is of the more-is-more variety. As you wander around reception for a mooch, expect about five members of staff ready to check if you need anything. The trick is to silence your English preference for no fuss; just kick back, enjoy the personal attention and make pals with the staff. They’re lovely. As a large, luxury hotel (and one with demanding clientele), nothing is too much trouble here. Need a tour guide? They’ll sort it. A rejuvenating massage? Try their signature treatments. 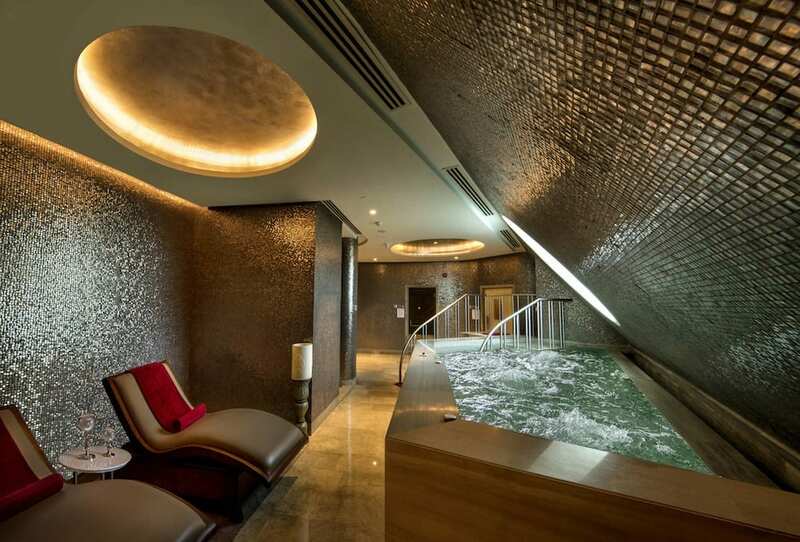 Even those torn between spa time and exploring Hyderabad can opt for their Brisk Spa: quick but effective treatments that leave guests feeling like new. There’s a gym, outdoor pool (a bit awkward to get to, mind), small hydrotherapy area, salon, wellness rooms for those who prefer in-room self-care, and a health menu too. They’re big on environmental issues – ITC is the only company in the world of its size to have been carbon positive for 13 years and water positive for 16 years – so you can bask in its beautiful surrounds knowing it won’t cost the earth. This is where the higher levels of Indian hotels shine, and the ITC Kohenur is a prime example. Breakfast at the Golconda Pavilion is a feast, a feast I tell you, involving never-ending rows of buffet food, from delectable breads and pastries (try the sugar-free cashew muffin), to freshly-made smoothies, to bircher pots. Go easy the unusual hot food items, like mushroom fricassee and the spiced-up baked beans, for the south Indian fayre. It’s not often you can begin your day with a nose-wateringly hot egg curry or freshly-made masala dosa. 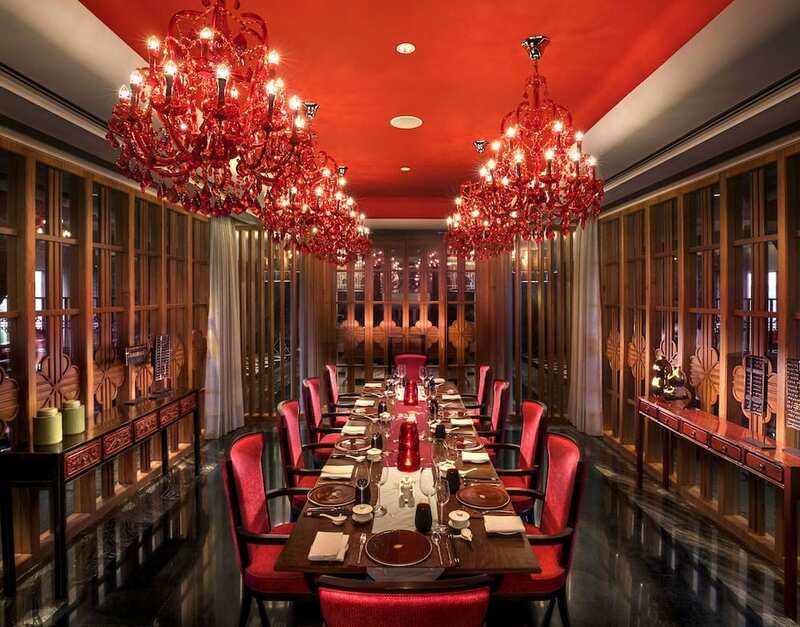 This sets the bar for some fine restaurants within the hotel’s angled walls. Ottimo is the brand’s Italian restaurant, and Yi Jing is contemporary Chinese cuisine that is as playful as it is divine-tasting – it might not have the reputation of Hakkasan or Nobu just yet, but the cleverly-presented dishes, like mushroom bao shaped like a mushroom (£3.70), and edamame dumplings given the form of a soya bean pod (£3.70), are just as moreish. You can shake the chef’s hand (if it’s clean) on your way out, as the kitchen is open. Time it right, and you’ll see them expertly make noodles from dough to pan. But top of the tastebuds is Dum Pukht Begums, a restaurant of traditional Indian cuisine served exactly the way it should be. They’ve everything from succulent lamb kebabs (£16) to garlicky naans, but leaving Hyderabad without trying their local dish of biryani is like going to Naples and forgoing a pizza. Originally created as a one-pot dish for moving troops, the secret is to slowly steam layers of rice, vegetables, spices and uncooked meat, in our case, goat (£16) together, with fire underneath and embers on its lid, so it delicately marinates and cooks at the same time. Served with a glass of Champagne or higher-level quality Indian wine, and salmon and veg will never quite have the same appeal. Once you’re checked in, make a beeline for the outdoor bar at the top of the building. 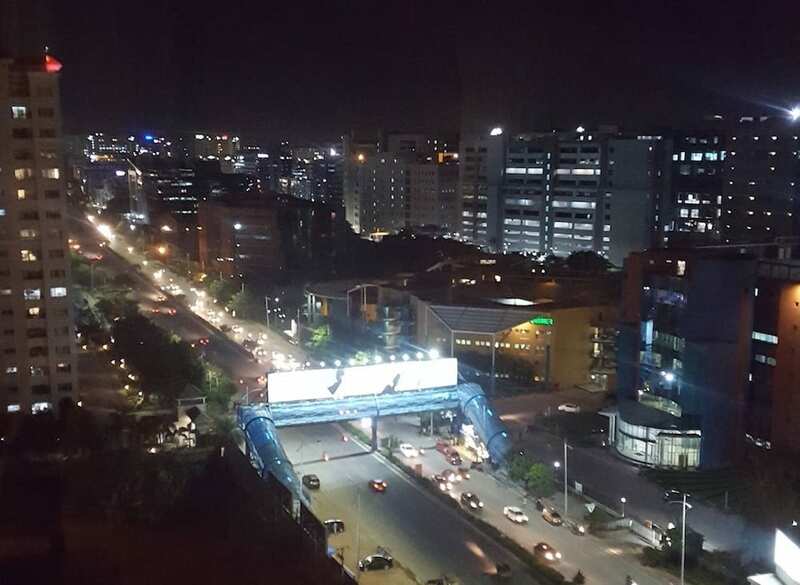 It offers views of Hyderabad it all its glory: the modern, bustling Hi-tec City on one side; and the shimmering lights of Old Hyderabad on the other. Shilpa was a guest of Jet Airways (flights from London to Hyderabad start at £419) and ITC Kohenur, Plot No. 5, Survey No. 83/1, Hyderabad Knowledge City, Madhapur (HITEC City), Hyderabad, 500081 (Rooms start from around £150 a night).